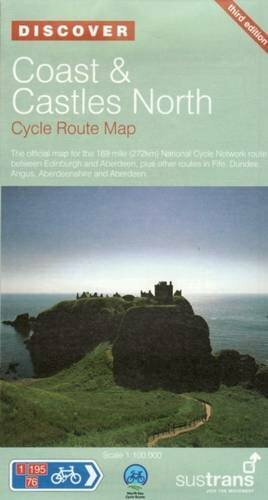 This linear map shows the route and immediate surrounding area over a series of separate map panels.The map covers the stunning northern half of the Coast and Castles cycle route, following it through the Lothian, Fife and Angus regions of east central Scotland.The Coast and Castles North route begins in Edinburgh, capital city of Scotland, crossing the Firth of Forth into the Kingdom of Fife with its beautiful countryside. The route then follows the coast north passing through Dundee, numerous fishing villages and historic sites, such as the cliff top ruins of Dunnottar Castle, on its way to Aberdeen. From Aberdeen there are ferry links onwards to Lerwick in the Shetland Islands, and Kirkwall in the Orkney Islands.This full colour map based on Ordnance Survey data shows clearly mapped cycle routes on traffic-free paths, quiet lanes and roads, with easy to read contours and route profiles. Also features detailed inset maps for the major towns and cities and linking routes.